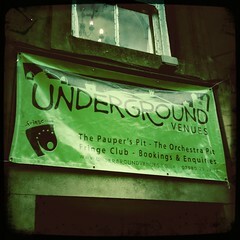 Underground has managed award-winning theatres and performance venues since 2006. Set up by two teenagers to bring more diverse performance into their home town of Buxton, Underground now runs the premiere and most popular venues on the Buxton Fringe, as well as producing work across the UK. In 2019 we’re running two venues, both at the hear of Buxton's festival atmosphere: The Clubhouse - our new base since 2017 with purpose-built theatre and Fringe Club, and the Arts Centre Studio - a state-of-the-art studio for larger-scale work. Our Buxton 2019 programme runs 3rd-24th July 2019. To find our venues and for opening times and access click here. Our mission is to get work in front of audiences who wouldn't have experienced it otherwise. This means programming diverse work in places that doesn’t have access to it, nurturing new artists that no-one else will take a risk on, encouraging new audiences into the theatre, and presenting fresh ideas to orthodox audiences. Underpinning all this is a refreshing and supportive atmosphere for artists, a joyous and welcoming environment for audiences, fair pricing, and a relaxed professionalism.